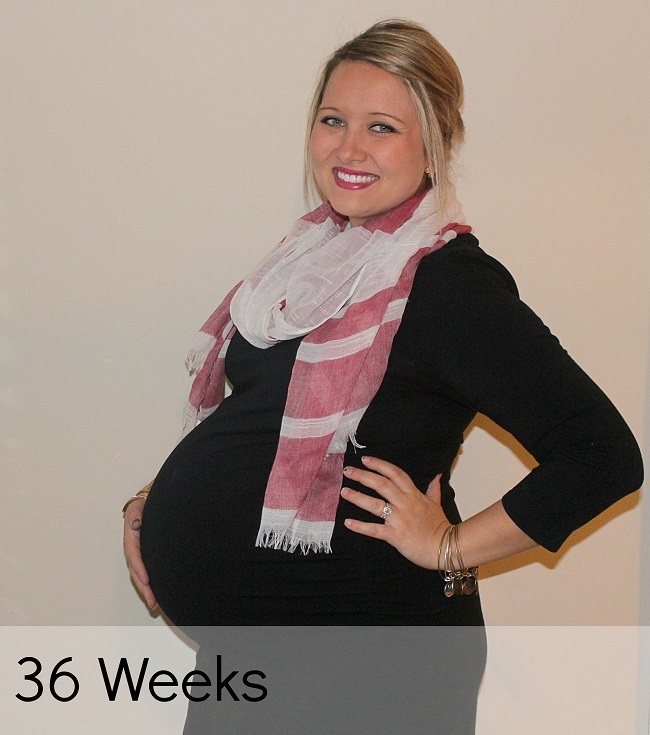 How far along: 36 weeks and officially nine months pregnant! Baby is the size of: a large cantaloupe. She's somewhere between 19 and 22 inches long and weighing around 6 to 6.5 pounds. Her liver, kidneys, circulation and immune system are all good to go by this point! 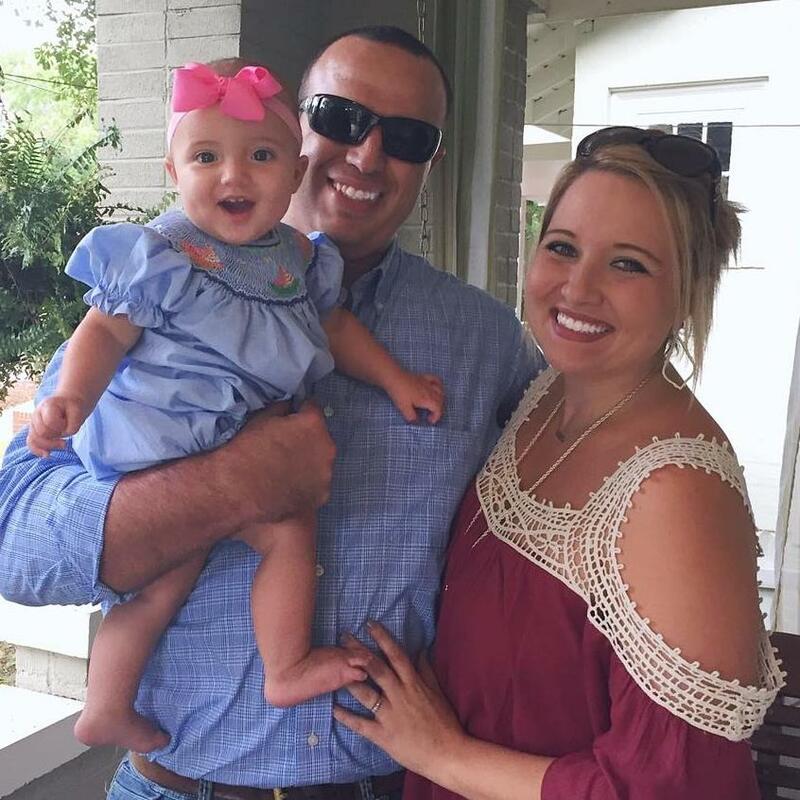 Symptoms: Just your typical nine month pregnant aches and pains. I'm definitely starting to get uncomfortable, and even the most simple tasks wear me out. Movement: She is definitely starting to run out of room in there! She looked great on my weekly non-stress test yesterday though. Nursery: It is DONE! I'm so happy with the way this little space turned out. I absolutely love and adore every part of her nursery. I'm planning to do full nursery reveal tomorrow, so be sure to check back then! You can see her nursery inspiration here. Labor Signs: I've been having pretty consistent braxton hicks contractions since last week. It's nothing painful, but I can definitely feel the tightening and release. I had a NST at my doctor's appointment on Tuesday, and a few contractions were showing up on there. I was looking forward to getting checked again at my appointment yesterday, so I was disappointed when the doctor came in and told me she wasn't going to check me until next week. Boo! Sleep: Sleep is about as good as you could expect at nine months pregnant. Best moment this week: Celebrating my birthday over the weekend! It was a low key birthday full of organizing the house for baby and relaxing with my husband. It was the perfect birthday for this nesting mama! Missing anything: I missed celebrating my birthday with a glass of wine (or two! ), but I made up for it with lots of birthday cake! Cravings/Aversions: I'm still all about the sweets, but I still don't have much of an appetite for anything of real substance. This makes deciding on meals nearly impossible! Mood: Anxious! I'm analyzing every little twinge and pain hoping that it means my body is prepping for labor. Looking forward to: Having a cleaning service come out and do a deep clean of my house next week. I can't tell you how excited this makes me! Thanks mom and dad for the awesome birthday gift!! Husband is: Getting more anxious by the day to meet his little girl. She's already wrapped around his finger, and I can't wait to see their daddy and daughter relationship blossom. New mommy question: What are some things you did to keep yourself (and your mind!) occupied while waiting for baby? I have a feeling these next three and a half weeks are going to draggggg by. Cant wait for your reveal post tomorrow!!! Sounds like you had a great birthday weekend, and yay for having someone to come and clean! Now that is an awesome present!!! I say we plan a girls night last week and squeeze it in before Charlie Beth gets here!!! Use this time for lots of little dates with your husband! Ice cream dates were my favorite at that point in my pregnancy. Go to the movies! Once baby is here, there is zero going to the movies! You're so close!!! Can't believe it's almost time for her arrival! So excited for you!! Holly belly! I can't believe you are already this close!!!! You are going to do GREAT! Ahh, so close! I cannot wait to see the nursery you have put together! So close!!! I wish I had some advice on how to stay occupied the last few weeks. I shopped A LOT, and spent the rest of the time googling symptoms and being anxious...eek! Can't Wait to see the nursery tomorrow. Spend time with your husband relaxing watching movies, tv, whatever while it's not being interrupted by a crying baby. Go out for treats and do things just on a whim. It is HARD to do that once baby gets here. I made a bunch of freezer meals too which has been an amazing help so far. You look amazing! Can't wait to see the nursery! Time is flying!! She is almost here!! I am going to miss these sweet posts, so I hope you share things about little babes when she gets here every Wednesday ;) ALSO, YAY nursery!